The 1968 election and Richard Nixon’s phoenix-like rise from the ashes after two unsuccessful campaigns, is the subject of CBS Sunday Morning’s latest special Remembering 1968: Richard M. Nixon’s Election Victory. Top campaign aids Pat Buchannan and Dwight Chapin are interviewed in the special, which examines multiple turning point moments in the campaign like President Johnson’s resignation and the tumultuous Democratic National Convention in Chicago. 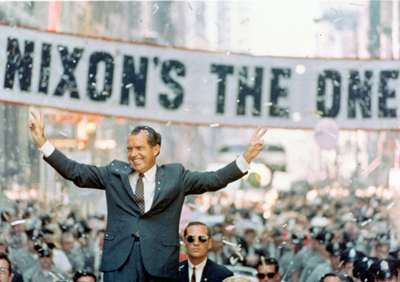 Watch the Remembering 1968: Richard M. Nixon’s Election Victory here.